There’s a very thin line between catering to “nerds” and pandering to “nerds.” One is like an invitation to a secret club where everybody likes comic books and Star Wars, and the other is like trying to worm your way into a secret club by wearing a Star Wars T-shirt you bought at Kohl’s. Ernest Cline’s book Ready Player One famously rode this line, with some readers loving the countless references to video games and sci-fi, and other readers being turned off by the countless references because it seemed like they were trying too hard. This is the problem that all nerd-centric things face these days, because nerd culture has become so prevalent in our daily lives that just talking about Star Wars is no longer special. So, with that in mind, we bring you a report from IGN that says a gym has opened in Los Angeles that caters exclusively to the “nerd” crowd. It’s called Nerdstrong, and we’ll let you decide which side of the line it sits on with this quote from its official site: “We are fitness training for those of us who want to become heroes in a collaborative, not competitive, environment. 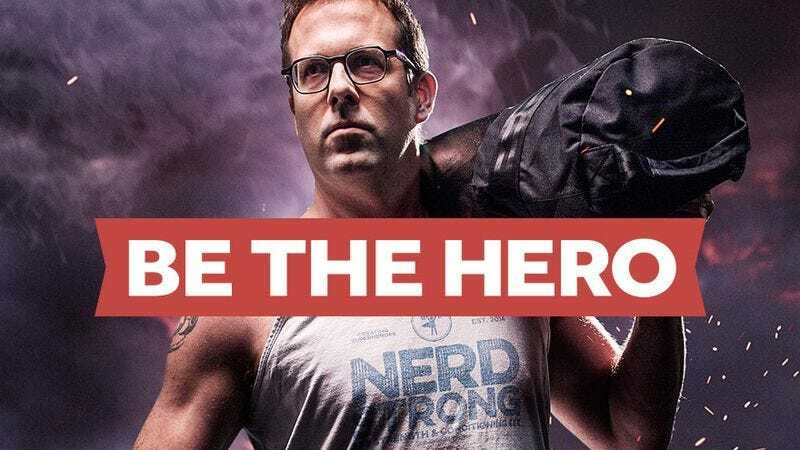 It’s time to stop being the scruffy-looking nerf herder and time to get #nerdstrong.” That’s combined with a handful of photos featuring buff men and women in Nerdstrong shirts wearing glasses (so you know they’re nerds). Assuming you feel sufficiently catered to and live in Los Angeles, you can get more information and sign up for classes at the Nerdstrong website.